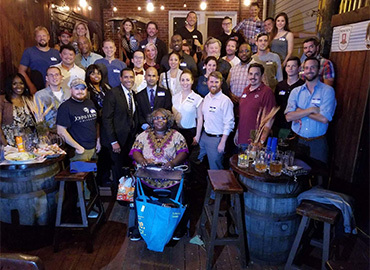 The Veterans in Media & Entertainment Washington, D.C., Chapter launched this month with a mixer hosted by Biergarten Haus Resturant, a Bavarian-style beer hall, which brought back great memories for our Veterans stationed in Germany. The amazing show of Veteran and community talent in Media, Film, TV and the Arts was confirmation that a VME DC presence is needed, and wanted. Thank you to everyone who came out, shared your amazing stories, talents, job opportunities, and enthusiasm to grow VME DC together. Frances A. Cheever and D.C. team will continue with the hard work and dedication in a collaborative effort with the LA chapter to build a platform that we can all stand on. Our VME DC spotlight member is Leo Cunningham, writer/director/actor, was born and raised in Philadelphia above a family owned Irish Pub. He is a Marine Recon Veteran who served in the GWOT on a Mobile Training Team in Yemen. He graduated from the prestigious USC, School of Cinematic Arts, with a degree in Film and Television Production. However, his greatest accomplishment is being the father of three sons. At the VME DC mixer Leo arrived with his VME profile shinning, his ability to share his story and listen to others while networking proved to be eye catching. Frances linked together the ambitious veteran with a gainful employer where Leo presented himself and talents, impressive to say the least. Leo interviewed the very next day and nailed it, he was a direct hire as a theater director, telling military stories. The selfless camaraderie between artistic Veterans at these events is directly related to the success of employing talented Veterans like Leo within the entertainment industry.